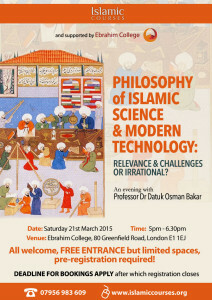 Home » PHILOSOPHY OF ISLAMIC SCIENCE & MODERN TECHNOLOGY: RELEVANCE & CHALLENGES OR IRRATIONAL? Professor Osman Bakar is one of Malaysia’s leading intellectuals and listed amongst the top 500 most influential Muslims in the world and was a member of the Council of 100 Leaders of the West-Islamic World Initiative for Dialogue founded by the World Economic Forum, Davos, Switzerland. 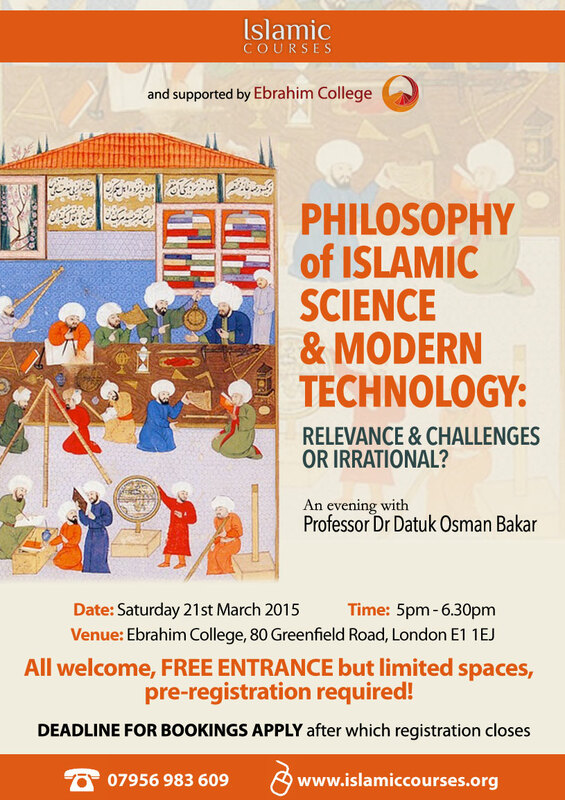 A former mathematician, he earned a doctorate in Islamic philosophy from Temple University, Philadelphia, USA. For over 40 years has taught and served as a advisor/consultant to a variety of leading international academic institutions across the world such as ISTAC, International Islamic University Malaysia (IIUM), Institute of Advanced slamic Studies, Malaysia (IAIS), Harvard University and Georgetown University in USA, and Doshisha University in Japan, and government bodies such as UNESCO and The Qatar Foundation. He has published 18 books, including ‘The History and Philosophy of Islamic Science’ and ‘Tawhid and Science’ and over 300 articles on Islamic thought and civilization, particularly on Islamic philosophy and science, contemporary Islam and inter-religious and inter-civilizational dialogue. Several of his writings have been translated into numerous languages, including Spanish, Arabic, Turkish, Chinese, Persian, Indonesian Malay, Urdu, and Bosnian. Currently, he is the Director of the Sultan Omar ‘Ali Saifuddien Centre for Islamic Studies (SOASCIS), Univeristi Brunei Darussalam.